The key innovation behind these efforts is the possibility of manipulating photons and electrons together in a single device. As the sophistication of building devices into the fabric of silicon has increased, researchers have learned to use devices based on or embedded in silicon to generate and process light quanta and photons, for data processing, storage, and more. Photonics offers the possibility of immense bandwidth for the transmission of data, as demonstrated by the capacity of the optical cables that carry the information weight of the Internet around the planet. Electronics, on the other hand, can store and manipulate exabytes or zettabytes of data as well as perform trillions of operations in an instant. 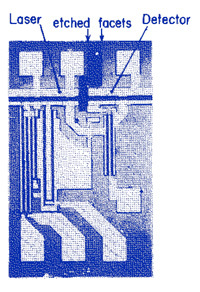 The two sister technologies, electronics and photonics, started with immense potential but also some seemingly irreconcilable differences. Products of Hajimiri’s laboratory illustrate these powerful congruencies and combinations. 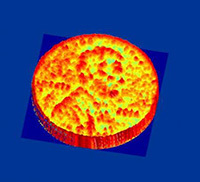 One recent example is a 3-D camera chip called a nanophotonic coherent imager (NCI) that translates laser illumination of a target object into high-resolution three-dimensional images. The prototype uses only 16 pixels but can scan a larger area by imaging four squares at a time to create a mosaic (see Figure 2). He imagines one possible application of this technology to be a 3-D camera on the surface of a T-shirt. Azita Emami, Professor of Electrical Engineering, is also working on the co-design of electronics and photonics to take advantage of this investment. Her lab is designing devices that can dramatically reduce the energy consumption of data communication systems in data centers and high-performance computers. 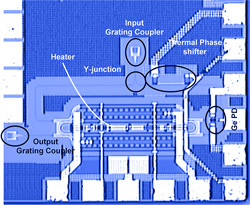 Examples of such devices are the silicon photonic differential micro-ring modulator (MRM) (see Figure 3) and the 3-D–integrated CMOS-silicon photonic optical receiver (see Figure 4). 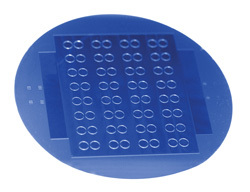 Such devices reflect a holistic approach to the design of electronics and photonics. Kerry Vahala, Ted and Ginger Jenkins Professor of Information Science and Technology and Applied Physics, has pioneered silicon photonic devices that dramatically lower the power required for nonlinear optical processes. Optical devices that traditionally require hundreds of watts of optical power are possible using 100,000 times less power, in the milliwatt range. This new class of extreme-nonlinear optical device is the underlying breakthrough in a number of integrated devices that can challenge the dominance of electronics in areas like microwave oscillators. Emami adds, “Caltech is a place where you can, at every dimension, find your research passion and explore new directions. Faculty take risks all the time. We do different things in any given stage of our careers. It’s amazing that we can do that.” Hajimiri agrees: “I think combining top-tier, high-quality scientific expertise together with risk taking at a place like Caltech has allowed it to be a center of gravity for the silicon photonics effort. Now we can take it to the next level, applying the concepts over a broad range of applications." Azita Emami is Professor of Electrical Engineering and EAS Division Deputy Chair. To learn more about her research, visit eas.caltech.edu/people/3341/profile. Ali Hajimiri is the Thomas G. Myers Professor of Electrical Engineering and Medical Engineering, Executive Officer for Electrical Engineering, and Director, Information Science and Technology. To learn more about his research, visit eas.caltech.edu/people/3038/profile. Kerry J. Vahala is the Ted and Ginger Jenkins Professor of Information Science and Technology and Applied Physics and Executive Officer for Applied Physics and Materials Science. To learn more about his research, visit eas.caltech.edu/people/3238/profile. Amnon Yariv is the Martin and Eileen Summerfield Professor of Applied Physics and Professor of Electrical Engineering. To learn more about his research, visit eas.caltech.edu/people/3262/profile.